Note on Lyrics: Text: Robert Louis Stevenson from "A Child's Garden Of Verses"
First Performance: Usher Hall Edinburgh with David Rintoul and the choir and orchestra of Mary Erskine School conducted by Helen Mitchell 25th March 1995. 3: Where go the boats? Unison voices with a strong Scottish accent! Themes and echoes are recapitulated as an orchestral coda over which is spoken (as if by Stevenson himself in his mid-thirties)'To Any Reader', a poetic epilogue that expresses both his ability to recapture his childhood memories and his regret at the passing of the years. The role of Robert Louis Stephenson as a man should be spoken by a male narrator and as a boy by a boy of about 8. Number 22 of the collection 'Lifecycle' is a piano transcription of the song 'Night and Day'. Blake, Howard (1993). ‘The Land of Counterpane’, op. 451. - 22nd August 2014 National Girls Choir of Scotland, 19 April, St. Cuthbert's, Edinburgh 22 August, St Giles’ Cathedral as part of the Edinburgh Festival Fringe. 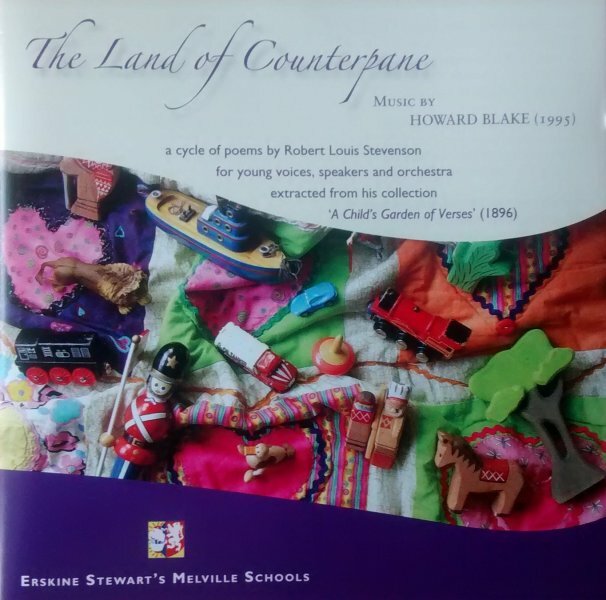 They were also in the unfortunate position of following pupils from the Erskine Stewart's Melville Schools who impressed with their incredibly crisp and precise articulation of Howard Blake's The Land of Counterpane. Based on texts from Robert Louis Stevenson's A Child's Garden of Verses, these catchy songs were well-suited to children's voices.